2014 will see AppsCare and Google going on tour with their ‘Going Google’ roadshows giving senior business and IT executives the opportunity to discover more about the transformational value of Google Apps and Cloud Computing. Senior business and IT executives will gain a strong insight into the transformational value of Google Apps. 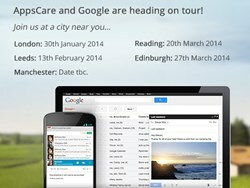 Due to the success of their ‘Going Google’ seminar which takes place in London every quarter, AppsCare and Google are taking the events on tour visiting Reading, Manchester, Leeds and Edinburgh. The events will provide senior business and IT executives with a strong insight into the transformational value of Google Apps, as well as the options available before, during and after deployment. The half day events, which are free to attend, will give attendees the opportunity to hear from Google accredited engineers and change management specialists, as well as representatives from Google. Visitors will also hear firsthand experience from organisations which have recently migrated to Google Apps. Manchester: date and venue tbc.